Very impressive despite its diminutive size, just like the real road rummer. It is spicy and strong with the sweetness and color coming from a teaspoon of grenadine and a quarter teaspoon of Pernod. The original recipe of this drink calls for 2 oz. gin and 1/2 oz. dry vermouth in a cocktail glass, but the glass is way too big for the amount of liquid. I used my sour glass instead. 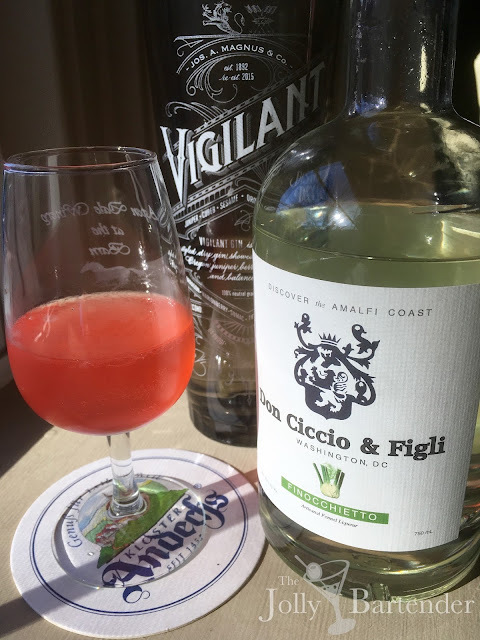 But this drink is more spicy and I felt it did it justice to substitute Don Ciccio & Figili finocchietto liqueur for the dry vermouth since the finocchietto plays very well with gin and Pernod--if anything it adds other herbs to the Pernod.